Oil trains are crisscrossing the US and Canada with volatile cargo, yet many communities aren't prepared in case of an accident. The explosions and fire destroyed some 40 buildings and killed 47 people, most of whom were enjoying live music at a popular cafe. Wooden homes along the lakeshore burned from the inside out as fire erupted out of water pipes, drains, and sewers. A 48-inch storm pipe that runs from the train yard to the nearby Chaudiere River became a conduit for the petroleum, spewing flames and oil more than half a mile into the water. “It looked like a Saturn V rocket,” says Robert Mercier, director of environmental services in Lac-Mégantic. Manhole covers on the Boulevard des Veterans exploded as columns of fire shot into the air. Campagna and his wife, Claudette Lapointe, grabbed their pillboxes and cell phones and fled. The hood of their car was so hot that he couldn't touch it. (According to Mercier, the heat could be felt for more than a mile.) From a safe distance, about a quarter-mile away, they watched as the town burned. In the early morning hours a steady rain began to fall. The surface of Campagna's umbrella was so warm that when the drops of water bounced off it they sent spirals of steam into the night. If not for the rain, Campagna says, the whole town would have been destroyed. “The rain saved us,” he says. “The Bakken shale has gone from close to nothing to a million barrels a day in a very short time,” Energy Secretary Ernest Moniz told an Albany newspaper in February. “And the infrastructure certainly just isn't there, certainly in terms of pipelines to manage that.” That means more and more shale oil will be shipped by rail in outdated cars, on tracks that are rarely inspected, and through towns and cities ill equipped to deal with a disaster. The economic and political pressure to move the oil far exceeds efforts to upgrade the nation's rail infrastructure and impose new regulations on either the oil or rail industry. Kenton Onstad, a North Dakota legislator who lives just outside New Town, where the train that exploded in Lac-Mégantic originated, says the nation's oil-by-rail infrastructure needs to be overhauled and that it should have started years ago. According to Onstad, public officials have known since 2009 that the amount of production from the Bakken would be close to what it is today, and yet they did little to prepare for the oil boom. “I think it was economics and profits versus safety,” he says. “We've got all kinds of failings on all sides, inadequacies that are coming to light because trains are blowing up all over the place,” says Fred Millar, a railway safety consultant. Smith now has conducted detailed analyses of Bakken crude from the three accident sites in Quebec, North Dakota, and Alabama, along with baseline data. He says he is the only outside expert to have done so and has shared those lab results with Earth Island Journal . Even government agencies — including the US Department of Transportation (DOT), which is tasked with regulating oil by rail transport — have been largely kept in the dark about the qualities that make Bakken crude so volatile as well as how it varies throughout the formation. “Despite the energy industry making assurances to DOT more than two months ago, we still lack data we requested and that energy stakeholders agreed to produce,” a Department of Transportation spokesperson told Reuters in March. Independent reviews corroborate Smith's findings. Chemists with California's Office of Spill Prevention and Response examined Smith's samples and concluded that the Bakken crude “resembles a typical crude oil that has been mixed with diesel or a diesel/gasoline mix. … Obviously, flammability and volatility are greater concerns with Bakken than with 'typical' heavier crudes.” In February the Wall Street Journal, based on its own analysis of data collected by the Capline Pipeline in Louisiana, reported that oil coming from the Bakken has significantly more combustible gases and a higher vapor pressure than oil from other formations. 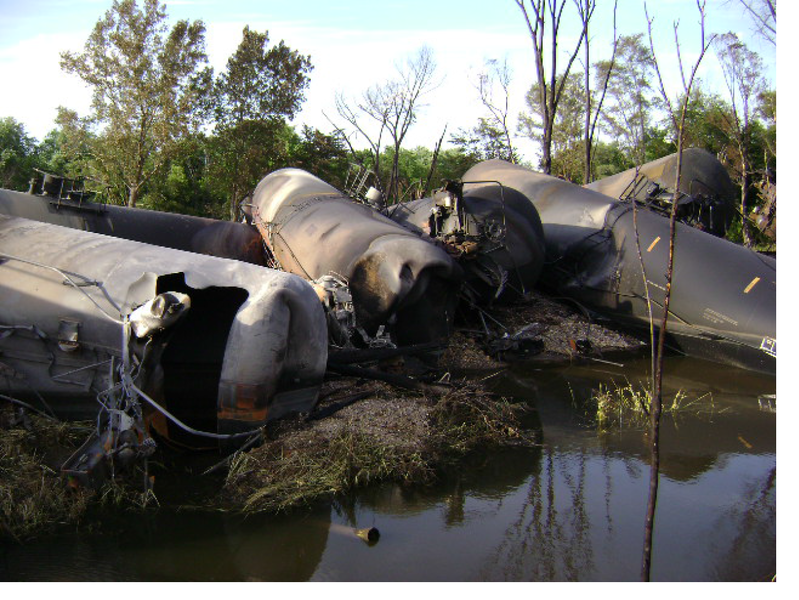 In early March, Canada's Transportation Safety Board (TSB) issued its own findings from oil samples taken from the nine tank cars that did not derail in Lac-Mégantic. While the TSB does not contend, as Smith does, that the Bakken oil is significantly different from other light sweet crudes, the agency also found that oil coming out of the Bakken has a very low flashpoint — which means that it ignites easily or at a relatively low temperature — a level more similar to unleaded gasoline. When the rail cars went off the track in Lac-Mégantic, sending up sparks and static charges, it didn't take much to set off explosions. “All of the conditions required for ignition to occur were present,” the TSB report concluded. Even the US government appears to be scrambling to understand precisely what makes the Bakken crude so dangerous. According to the Wall Street Journal, federal regulators seeking information about the flammability of Bakken crude have been rebuffed by the oil industry. When asked to respond to findings that Bakken crude may be especially volatile, a North Dakota Department of Mineral Resources spokeswoman, Alison Ritter, wrote in an email: “We do not have the expertise to analyze Bakken crude. Crude samples are submitted to us for possible third party analysis. It would be up to that independent analysis to make the determination as to the volatility.” Only in late March did the North Dakota Petroleum Council, an industry trade group, announce that it would be doing its own analysis of Bakken crude across 12 sites and six rail depots. However, interviews with local emergency response officials in Virginia, where a CSX train derailed in late April, suggest that the company's outreach efforts vary widely. According to Ryan Muterspaugh, director of public safety in Alleghany County, the railways do not supply information on volume, content, or frequency of rail cars with any regularity. “The railways are not as forthcoming with their transportation information as we (or anyone) would probably like them to be,” he wrote in an email. “Our emergency management personnel or fire/rescue agencies have not had any interaction with the railroad specifically regarding the transportation of crude oil.” Gary Roakes, the fire marshal of Amherst County, which borders the city of Lynchburg, wrote: “We have not had any contact with CSX or any other carrier about what is being shipped through this area.” Kohut says he has never heard of SecureNOW. According to Genesee & Wyoming, the rails had been inspected just four days before the accident and, over the past year, had received a “disproportionately high” level of investment. “There was no concern about the state of the track,” the company's CEO told Reuters. The company also noted that the train was going slower than the 40 mph speed limit. In addition, it's a straight section of track on flat ground. Had the explosion occurred a few miles up the track, it would have ripped through the small town of Aliceville, which has a population of about 2,500. The same goes for the Casselton collision, which occurred a mile from the center of town. Local officials, fire departments, and emergency responders had very little to go on. “We had no idea it was this volatile,” Casselton fire chief Tim McLean told a local paper.